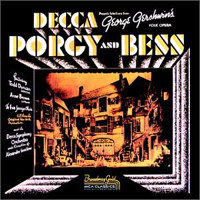 Studio Cast, 1951 (Columbia, 2CDs) (5 / 5) While this recording is not “complete” as advertised, it contains so much more of Porgy and Bess than had previously been recorded that the exaggeration can be forgiven. Of the many fine studio recordings of great musical theater scores conducted by Lehman Engel and produced by Goddard Lieberson, this one is the cream of the crop. Among the singers are original cast members Warren Coleman as Crown, Edward Matthews as Jake, J. Rosamond Johnson as Frazier, and Helen Dowdy, who sings Maria in addition to her original role of Lily. Coleman lunges at some of the notes and speaks rather than sings much of Crown’s music, but he makes the character dramatically potent and truly menacing. Avon Long is back as Sportin’ Life, and although his voice isn’t ideal for the part, his performance oozes with personality. Camilla Williams is an adequate Bess, if a bit droopy of tone. 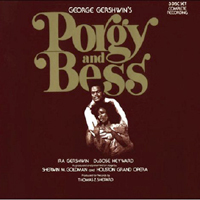 But Lawrence Winters is magnificent as Porgy; his ringing high-baritone voice sounds ideal throughout the recording and then, just when you think he couldn’t possibly top himself, his delivery of the climactic line “I gotta be wid Bess” in the final scene is thrilling beyond description. Lehman’s conducting is always on point, and the sound quality of the recording is excellent for 1951 mono. Overall, a triumph.– M.P. Film Soundtrack, 1959 (Columbia/no CD) (3 / 5) This is an aural document of a troubled film. The album has been out of print for years; I somehow acquired a hiss-laden Japanese CD pressing that sounds like it was transferred directly from the LP master tape with no digital processing whatever. The movie itself stars Sidney Poitier as Porgy, Dorothy Dandridge as Bess, Sammy Davis, Jr. as Sportin’ Life, Pearl Bailey as Maria, Brock Peters as Crown, Ruth Attaway as Serena, and Diahann Carroll as Clara, but only Davis, Bailey, and Peters do their own singing — and, for contractual reasons, Davis is not heard at all on the soundtrack album. Instead, Cab Calloway sings Sportin’ Life’s “It Ain’t Necessarily So” and “There’s a Boat That’s Leavin’ Soon for New York” with an engaging personality that lacks the sense of evil necessary to the character. 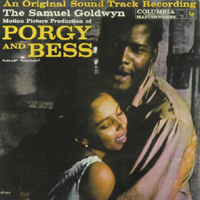 Despite its flaws, this recording is worth tracking down if only for baritone Robert McFerrin’s extraordinary performance of Porgy’s music, dubbed for Poitier, and Adele Addison’s lovely singing for Dandridge. Both rein in their operatic voices somewhat for the film medium, but they still sing beautifully under the skillful, respectful musical direction of André Previn and Ken Darby. — M.P. 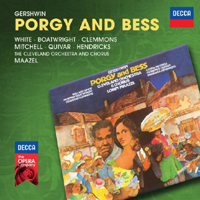 Studio Cast, 1963 (RCA) (4 / 5) There are many recordings of highlights from Porgy and Bess, but this one is exceptional for its superb singing, conducting, and sound quality. Opera diva Leontyne Price had one of the most beautiful voices of the 20th century; she toured in the role of Bess for two years(1952-54), and posterity should be grateful that she recorded large portions of this score when she was in her vocal prime. Her Porgy on tour and on the recording is William Warfield, to whom Price was briefly wed; the marriage may not have worked out, but they sure make beautiful music together, she with her glorious soprano and he with his warm baritone. Less successful is McHenry Boatwright, who brings a stuffy operatic sound to the role of the brutal Crown. But it’s great to have original Sportin’ Life John Bubbles on hand; although by the time of this recording his voice had weakened with age, Bubbles still had style for miles. The two leads sing sections of the score that were written for other characters, but this compromise of dramatic verisimilitude is justified when we hear Price’s thrilling renditions of “Summertime” and “My Man’s Gone Now.” Skitch Henderson conducts with tremendous verve, and the technical quality of the recording is astoundingly good. Be sure to attenuate the volume control of your sound system during the orchestral postlude to “There’s a Boat That’s Leavin’ Soon for New York” if you don’t want to disturb your neighbors. — M.P. 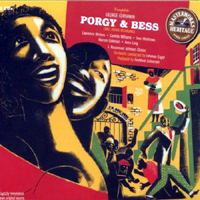 Studio Cast, 1976 (London, 3CDs) (3 / 5) For 40 years after the premiere of Porgy and Bess, no truly complete recording of the score was available; then, two such recordings were released in 1976. This one features the first-rank conductor Lorin Maazel leading the Cleveland Orchestra. Willard White is an estimable Porgy, if perhaps a bit too bass-sounding for some tastes. Leona Mitchell is in fresh and lovely voice as Bess. McHenry Boatwright, who was Crown on the 1963 recording, is back and he sounds even stodgier here; but Barbara Hendricks as Clara, Florence Quivar as Serena, and Francois Clemmons as Sportin’ Life are very well suited to their roles. In terms of sound quality, this is a full, rich, and exciting recording. — M.P. 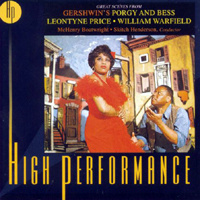 Houston Grand Opera Cast, 1976 (RCA, 3CDs) (5 / 5) A superb production of a great American work marked the country’s bicentennial when the Houston Grand Opera’s Porgy and Bess came to Broadway in 1976. Because this complete recording was based on an actual stage production, it has a palpable theatricality, and John DeMain’s conducting of the score is beyond criticism. The solo singers are generally fine, if only definitive in one case: Larry Marshall is the best Sportin’ Life on records. Donnie Ray Albert displays a strong baritone as Porgy, but his voice may strike some listeners as too “operatic” for the part, and his sibilant esses are distracting. As Bess, Clamma Dale proves herself to be a great singing actress. ; she sounds marvelous, and more vibrant than her Porgy. The singers in supporting roles help make this recording really special: Betty Lane offers what may be the most ethereally beautiful performance of “Summertime” ever, Wilma Shakesnider is immensely moving in Serena’s “My Man’s Gone Now,” Carol Brice’s Maria is a powerful force to be reckoned with, and Andrew Smith has just the right voice for Crown. The large chorus and pick-up orchestra sound fabulous throughout. Although Albert’s Porgy is not all that we might wish it to be, this set still rates five stars because it’s by far the most satisfying of the three note-complete recordings of a true American masterwork. — M.P. Studio Cast, 1989 (EMI, 3CDs) (1 / 5) What might have been an estimable recording of this masterwork is sabotaged by Simon Rattle, a maddeningly willful conductor who seems more interested in self-aggrandizement than in interpreting Porgy and Bess according to the composer’s intentions. Several of the tempi that Rattle sets for the London Symphony Orchestra are ridiculously fast, others are absurdly slow, and there is no sense of dramatic cohesion throughout the opera. That’s unfortunate, because the singers are strong: Willard White is back as Porgy, sounding even better than before, and he’s superbly partnered by the Bess of Cynthia Haymon. Also happily on hand are Gregg Baker as the sexiest Crown imaginable; Damon Evans as a slick, very well-sung Sportin’ Life; and Harolyn Blackwell as a pure-toned Clara. 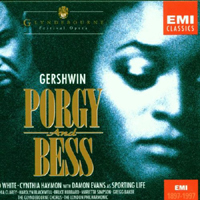 After the fact, this recording served as the soundtrack for a 1993 video version of Porgy and Bess that’s deplorable not only because it’s so badly lip-synched, misdirected, and poorly conducted, but also because it was apparently sanctioned by the Gershwin estate in lieu of a TV telecast of the fine Metropolitan Opera production. — M.P.